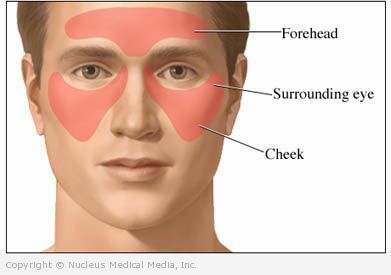 Sinus headache refers to head and facial pain associated with inflammation of the sinuses (called sinusitis). The sinuses are hollow cavities in the skull that have openings into the nose. Colds and allergies cause inflammation of the nasal passages and can lead to sinusitis. Sinus headache is a symptom of sinusitis. Allergies and viral upper respiratory infections increase nasal secretions and cause tissue lining the nasal passages to swell. This results in nasal congestion and stuffiness. The nasal passages become blocked and normal drainage cannot occur. Secretions that are trapped in the sinuses may become infected with bacteria or, rarely, fungus. The swollen tissue or infection may create pain and pressure. The doctor will ask about your symptoms and medical history, and perform a physical exam. Your nasal secretions may be tested for allergies and infection. Decongestants to open clogged nasal passages, which allows the sinuses to drain—Do not use longer or more often than directed. Overuse of decongestant nose sprays may increase swelling and make your symptoms worse. Breathe warm, moist air. Try inhaling steam. Try a mist of saline nasal spray to moisten the nasal passages and help remove crusty secretions. A saline spray can be used up to six times per day. Ask your doctor for directions on how to perform nasal irrigation that you can do at home. Surgery is usually not required. Patients with a structural abnormality or chronic sinusitis that does not respond to medications may benefit from surgery. The doctor may perform one of several procedures to clean out your sinus cavities. If you are diagnosed with a sinus headache, follow your doctor’s instructions. Seek medical treatment for allergies. Check with your doctor about using a decongestant before air travel.